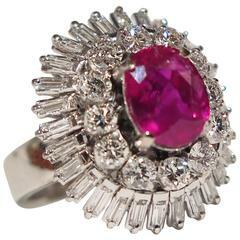 Exceedingly fine 2.09 carat unheated Ruby oval, accompanied by an AGL certificate enclosed. This very desirable gem is superior in color, clarity and cut. ***Returns are accepted within 7 days of delivery and will gladly be paid by us. Rings resized upon request, may also be returned. 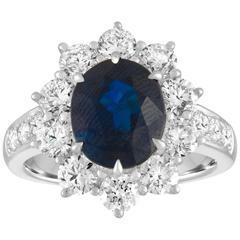 A gorgeous and color-rich cabochon sapphire weighing 4.20 carats, set in an antique art deco style platinum band accented with round diamonds. AGL certified the cabochon sapphire.